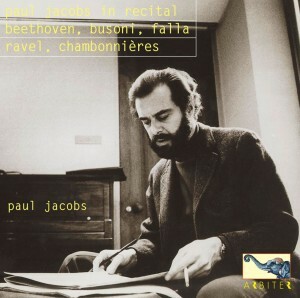 In concert, Paul Jacobs unleashed a volatile side that was merely hinted at in his meticulous studio recordings. His examples of repertoire that had not been recorded otherwise reveal a fiery temperament and penetrating musical virtuosity that offer another perspective of a great artist. Also included is an example of his refined harpsichord playing. Paul Jacobs specialized in performing contemporary music. The discovery of concert tapes donated after his death to the New York Public Library by Teresa Sterne, his producer and associate, document rare unrecorded repertoire. In hearing him unencumbered by the recording studio’s environment, an expressive and radiant intellect bursts forth in emboldened performances. This often-heard sonata, the twenty-first of 32 for solo piano, is usually known as the “Waldstein,” after Count von Waldstein, an early patron of the composer, to whom the work was dedicated. It is typical of Beethoven’s “middle period” of composition, in which he also completed the Fifth Symphony; and demonstrates his expansion of musical forms and instrumental resources. His codas now expand so as to become almost second development sections; and he makes maximum use of sonorities available on the piano, including strange, blurred pedal effects, slides, and simultaneous use of extreme registers. The musical gestures of the work are striking and dramatic. No wonder that Beethoven ­ a famous pianist in his own right ­ had the reputation for breaking strings and hammers. Note that the slow movement is not autonomous, but acts as a transition to the rondo. Around 1722 Bach finished the first volume of his Well-Tempered Clavier, a work for keyboard instruments consisting of twenty-four pairs of pieces, one free, one strict, in each of the major and minor keys. About 200 years later, Ferruccio Busoni, a well-known pianist and composer, included in a book of studies based on music of other composers called ‘For Three Hands’ the fanciful idea of playing together the brilliant prelude and the stately fugue. At the point where the two superposed pieces would no longer sound well together, Busoni joins the tail to the head for a circular piece without an end. Provinica Baetica was the old Roman name for Andalucia and so a translation of the title might be ‘Andalusian Fantasy.’ Although the materials used are original with Falla, they strongly evoke the folk music of southern Spain: the strident, somber cante hondo sung in oriental-sounding scales, chords derived from guitar tunings, and a harsh percussive quality reminiscent of castanets and heel stamping. The form of the piece is very loose but the marked recapitulation and the key relationships are not far from sonata-allegro form. The work was written for Artur Rubinstein [and first recorded by Mark Hambourg]. Towards the end of his life, Franz Schubert (1797-1828) wrote two sets of waltzes, one entitled Valses sentimentales, and the other Valses nobles. Almost a century later (1911), Ravel composed his highly stylized and very French pastiches. Ravel’s set includes seven waltzes, concluding with an epilogue that recalls the earlier movements. What contemporary jazz composer would not envy Ravel’s sense of harmony? The following interview was conducted at Paul Jacobs’s home by Michel Carton on May 6, 1976. When did you first go to France? In 1951; I arrived July 4th. I hadn’t been out of the [United States] at all. There was a kind mystique [about France] in the family: my mother and father had been to Europe in 1929, and for some reason Paris caught on and they talked about it a great deal. They had a book at home which was very funny – how to speak French in 10 easy lessons. So I knew that already when I was about 13. Then I got to listen to the music – that touched me first. When you’re a kid you play, you play everything that’s given to you and you love it but you don’t have many musical tastes when you’re 6 years old – they start when you are about 13 or 14. I remember among my earliest tastes were the trinity Debussy-Ravel-Stravinsky. That came through to me – that was my favorite music. What really lead me to them was that I got in to the high school orchestra as timpanist and percussionist and when you get interested in those instruments, you have to get interested in 20th Century music. So I was always looking out for percussion parts and one of the first things to catch on was Daphnis et Chloë. My mother decided before I was born that she would have a pianist. My father couldn’t have cared less, he went along with everything she said. The training wasn’t terribly good. Most things I’ve formulated are ideas I’ve had. I would say that essentially I am auto-didact! [laughs]. I was put on the piano when I was five years old, four even. I was made to practice my hour-a-day until my mother went to work when I was 12, then I used to feign having practiced. Practicing is still a problem. . . sometimes. . . I suppose when I was six, because I immediately gave some sort of public performance that got written up in the papers. Then my mother decided that she had this little genius on her hands and would show him off – I told you she wanted a pianist. She took him around to radio stations and such and got him to play – a trained-dog thing. So when does my career start? It starts right away. Who were your first teachers? Do you remember them? Yes I remember them very well. They were ladies who were piano teachers because they weren’t pianists. But I went to the [Third Street] Settlement School and there was something profitable in doing something other than play the piano. We had theory exercises to work out. Who were the later teachers who had the most significant effect on your choices and career and its direction? Boulez was an influence in my life, I think. His taking of such a positive stand about what contemporary music meant to him was very impressive because it meant that I saw how necessary it was to take a polemical stand on what one believed in as being right for the present times. One couldn’t necessarily influence it but one could stand up for what one believed and denounce what one didn’t. Would you say that the French have been very severe in their relationship to contemporary music? What I saw was just in the 1950’s: I don’t know what is going on now. At the time I did have the impression that contemporary music for Paris anyway was a social affair at the time, maybe it’s changed. I know there’s a ‘youth culture’ now in Paris that listens to contemporary music which I knew nothing of in the 50s­ that didn’t exist. Crowds of young people went to concerts of someone like Honneger: I remember the students screaming and chanting his name at the end of one of his concerts. Poor man, he died and everyone forgot all about him. But that was contemporary music for the young. Xenakis certainly not, nothing remotely resembling that. You saw people at contemporary concerts you never saw at other concerts: lots of painters, writers, and dinner at Suzanne’s – that was important. I suppose you could say that was the equivalent of the American scene at that time. There were painters involved with contemporary music. . . True enough, but in a very special segment of it. It was John Cage here in America and in France it would have been Serialism at the time as Boulez was the most prominent person there. Did you come in contact with any of the people working in the so-called ‘new forms’ who were attached to the research studio at the ORTF [French Radio]? No, because of my association with Boulez, who was a persona non grata with the government at the time. That’s certainly changed! He’s going back quite a different figure than he left. Now he’s a hero but then he was denied access. I remember something that actually went to trial: Mme. Jolivet sued Pierre Boulez for libel. And Jolivet had an official position in determining subsidies, so whether the Domaines Musicales would get a subsidy or not depended on people who were very hostile to his way of musical thinking. I did a complete Schönberg for Ducretet Thomson when it existed when I was in my twenties, and for Barclay, I don’t even have a copy of the record myself [solo and chamber music of Schönberg, Webern, Messiaen], I just did a few thing on [this] strange record, and a couple of things for the Domaine Musicale – Stockhausen Kontrappunkte and I don’t know what else. Oh yes, I recorded two Beethoven piano concerti with René Leibowitz. So far I haven’t played any Schumann in public – that might very well change with the years but I would definitely rather play Bach, Mozart, Beethoven, Schubert, and a lot of pre-Bach music because I play the harpsichord. How have you integrated your performances on the harpsichord into your career? It must demand a totally different approach. . .
A harpsichordist will tell you that. These harpsichordists who fumble about and have such troubles with their instruments are people who would have been laughed off the stage if they were pianists to begin with. It’s just not a question of the harpsichord being a different mystique. The 18th century had keyboard players playing all kinds of instruments: if you played the organ then you went home and practiced on the clavichord, and there are no two more different touches, and they played the harpsichord, and when it became available, the fortepiano. This nonsense of “Doesn’t it do things to your technique?” or “Doesn’t it require a different discipline?” or mode de pensée, no. Yes, there are certain things you have to do with a harpsichord which you learn to apply to the piano too. The harpsichord teaches you a great deal. If you are a very good musician, you should understand the musical problems and the expressive problems of a good composer, a bad composer you’ll understand without any question, but if you’re intelligent, sensitive, and if you’re a good actor, if he be John Bull or Karlheinz Stockhausen, why shouldn’t you be able to play both for the instruments for which they were intended? And stylistic problems have to be resolved in some cases by research – you have to find out what the performance practice was of the time and then you live with the instruments for which they were written and you understand other problems, so the idea of playing many instruments should, on the contrary, be more frequent than it is today. Chamber music. . . well, that is, for the moment, I hope not forever, reserved for contemporary music because I like to play in small ensembles, which is what contemporary music is about. I suppose that all questions of musical style, structure, dramatic purpose, are problems indigenous to both centuries, but that doesn’t mean to say that I’m not passionately interested in the 19th century, just because I don’t play very much of it doesn’t mean to say that one day you won’t hear just huge masses of Liszt or whoever else might suddenly occur to me to play. But the sense of music history is very important to me. Who is responsible for what is a fascinating thing for me. As far as affinities go, one inevitably has to make a choice. You don’t have time to play everybody, as much as you like the whole history of music and would like to play it all, your very choices reflect your tastes. I feel absolutely perplexed at times why performers don’t feel at home with the music of their own century. The music that hit me first when I was an adolescent was the music of the beginning of the century, all the way up through Stravinsky even in his later years. It just doesn’t pose any stylistic problems, it’s as easy to speak as if you were reading the newspaper, I know just what to do with it. I should think that one would always be aware of what was going on in one’s century. I don’t understand what this resistance is. Do you think there has been a rupture in the tradition of music? What do you think about progress in terms of music? If you knew me better you’d probably find me a rather conservative musician because I feel that the music that touches and interests me the most is music that issues very directly from what we think of as the Western musical tradition. There are many experiments that are taking place today that I may find interesting, successful, but I don’t find them projected along the line that I am most sympathetic to and therefore I can’t say that, as interested and taken in by it as I am, it’s not the music that touches me most deeply. Music that moves me the most? Debussy has stayed with me as a passion. . . it’s impossible to divorce expression and technique, nonetheless a piece must be highly expressive, by which I mean that as Elliott Carter might put it, his scores are ‘scenarios’ for the performers, and as a performer I want this exciting scenario to project. What makes it exciting? Well, when it works musically it’s going to be dramatically effective, it will have a theatrical quality to it that will move you by its gestures and that the person working on this piece discovers that these gestures are composed with a sureness and intelligence, a rightness and an imagination, and an invention. Some of them play well, some don’t, but whatever I have to do, I have to learn that score from the ground up and the conclusions I come to will be my conclusions, and I won’t do it some way because somebody else does it that way. Do you feel while performing that there is a moment of truth when coming to grips with a work? All notes and translations © Allan Evans.